Hanna Reher, Wendy Harvey, Gael Horvat, Lyn Cummings. Standing – Sheila Francis, Regina Baker of the Port Stephens Community Arts Centre with some of the Jumpers that they have knitted to help farmers save their lambs. THERE is no denying that the country is undergoing a devastating drought and nothing can be more heartbreaking for a farmer than to see his ewes lamb and then abandon them. The ewes simply are not strong enough to raise a lamb and are looking to survive. Farmers are collecting the abandoned lambs and hand feeding them in what can be described as a desperate bid to save their farms and livestock. 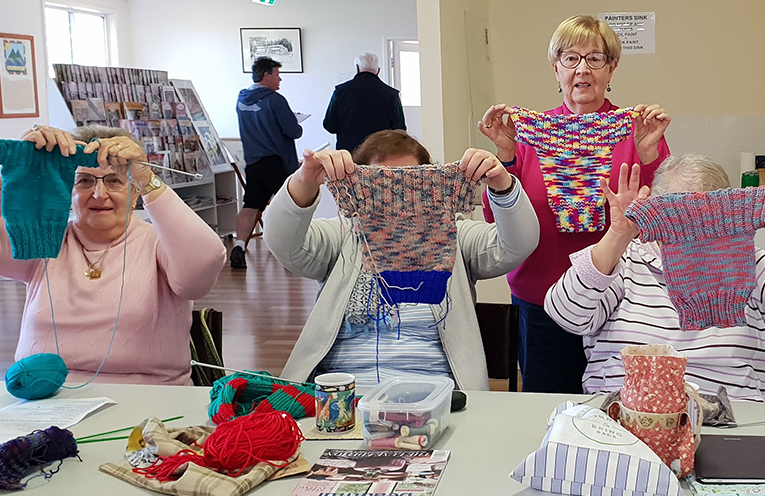 The Port Stephens Community Arts Centre patchwork ladies were heartbroken to see news items in the media on how regional farmers are struggling with the drought. Meryl Miller of the Port Stephens Community Arts Centre told News Of The Area, “The Regional Farmers are hand feeding the lambs however it’s a problem to keep them warm. Each Tuesday morning the Westralia Room at the Arts Centre is usually filled with sewing materials and quilting enthusiasm. “This week everyone had pulled out their pieces of wool to start looking after our lambs,” she said. So far the enthusiastic ladies have made 30 lamb sized jumpers. With different patterns being used for the ewes and rams. The Port Stephens Community Arts Centre is also holding “A Spring Affair” to welcome the start of Spring on Saturday 1 September.